This is the famous 21 metre high glass pyramid that is located in the middle of the Cour Napoleon of the Louvre museum in city centre Paris. It dates from 1989 and was designed by the celebrated Chinese/American architect I M Pei. 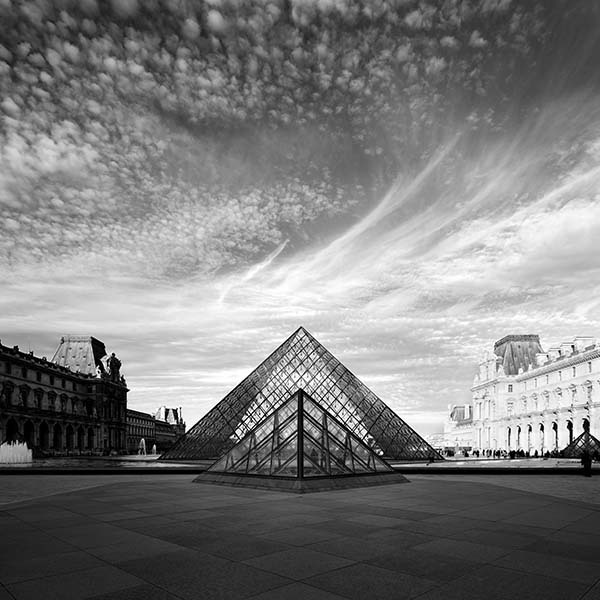 Simple, strong shape and symmetry are obvious key aspects of I M Pei’s design for both the building and in the choice of its central location between the north and south wings of the older Louvre buildings. The pyramid is a building that I’ve photographed often over the years and although I’ve tried photographing it using lots of different compositions my favourites have always been photos like this one that reflect these strong ideas of simplicity, symmetry and visual balance. Of all the various attempts at symmetrical photographic composition that I’ve tried, this is the one that has fascinated me most during the many years that I’ve been visiting the Louvre. Bizarrely, the reason for this is because of the addition of one extra asymmetrical element that nature brings at dawn - it’s the beautiful yin-yang way in which the first rays of the rising sun light up just one side of the old Louvre buildings leaving the opposite side in deep shade. Over the years I’ve taken many versions of this exact composition but it was the beautiful sky on the occasion of the visit in December 2012 when I took this photo which was the final piece of the photographic jigsaw which completed the picture. I wonder how many amongst the millions of tourists that visit the Louvre every year to look at the works of art also take the time to pause and look at this beautiful and enigmatic effect of the dawn light. One of the main joys in my adult life from working as an architect and also from my passion for photography is that both disciplines have trained me to look so carefully at the world and to better appreciate its beauty. The pink triangle on the map shows the view through my camera with the right hand point of the triangle being my location in the Louvre coutyard.